The Sincere Cry of Many Fatherless! I heard somewhere that a leader in the world is He who is served by many, but that the leader in the church is He who serves many. Paul stated that it is the will of God that the father will treasure for his son, and not the son for the father. God called Moses for the people of Israel not the other way around. Last time I check a shepherd don’t lead his sheeps by going in front of them but by coming after them from behind. For there is something foundationally wrong in the new testament church about leadership. In my humble opinion (may God have mercy on my soul) the problem lays upon our definition of ministry. Neh. 2:10 “But when Sambalat the Horanite, Tobias the amonite official heard of it they were deeply disturbed that a man had come (not to build the wall) but to seek the good of the people of Israel”; 2 Timothy 2:10 “For I endure all things for the sake of THE ELECT, so that they can obtain the salvation which is Christ Jesus with eternal glory”. My point: In the work of the ministry the key is not How much you love God, but How much you love people! It’s not about the call, it’s not about the vision, it’s not about the ministry, it’s not about success and it’s not about reputation. It is about loving what God loves the most… people. For God loves people more than anything. By the way; God has call upon us not to be successful but to be faithful (Mother Teresa). I don’t know about leaders. But this I know, I have been fatherless since I was nine. Godly loving fathers we need. I hope there is one out there who can pastor me. I think servant leadership as the norm for pastoral ministry needs to be discussed and examined before it is assumed as a starting point for church leadership. Men and women view servant leadership differently. Men identify with a servant leader as a leader who serves. While most women experience a servant leader as a servant who tries to lead. As a result, most men recognize women first and foremost as servants and not real leaders. Therefore, it is critical that we value the experience of women as explore how liberating Jesus Christ’s message really is. When Jesus Christ declares that his disciples are no longer servants but friends, he is speaking a word from his heart! He is declaring a new relationship. Jesus said, “This is my commandment, that you love one another, just as I have loved you. Greater love has no one than this that one lay down his life for his friends. You are my friends, if you do what I command you. 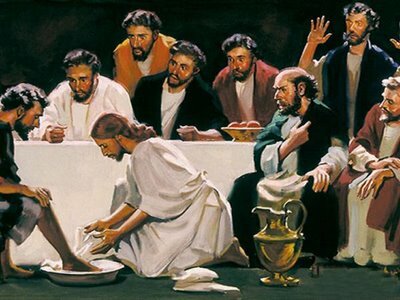 No longer do I call you slaves, for the slave does not know what his master is doing; but I have called you friends, for all things that I have heard from My Father I have made known to you” (John 15:12-15). The emphasis for most people is on the statement, “Greater love has no one than this that one lay down his life for his friends.” However, Jesus is not speaking here of his death as an atoning sacrifice in which he laid down his life for the sins of humankind, for our redemption. He is speaking of his death as a voluntary surrender for the good and well-being of those he loves. I believe that the rest of the passage is as important as the first part. Although redemption has happened the church still needs to proclaim the risen Christ because the world just doesn’t get it! Jesus is calling us into a new relationship. “No longer do I call you slaves, for the slave does not know what his master is doing; but I have called you friends, for all things that I have heard from My Father I have made known to you.” Jesus was clear in his message! We are to love one another so that God’s friendship can be known to the world. I believe that this idea must dominate the relationship between pastors and their congregation. In fact, the term “servant leadership” was coined by Robert K. Greenleaf in 1977 with the publication of his highly influential book, Servant Leadership: A Journey into the Nature of Legitimate Power and Greatness. Greenleaf’s inspiration for servant leadership did not come from Scripture. Jesus is merely a role model like other great men in history. Greenleaf claims that servant leadership is “an enterprise for confident individuals one’s leadership is self-contained.” I would contend that such servant leadership is not really concerned with the needs of others, but concern for one’s own abilities in stressful situations. As a result a servant leader is often much more than goal-oriented; he seeks to be in full command, planning every detail of the church. And the congregation is relegated to simply carrying out his vision. When pastors view themselves as “indispensable leaders,” they demonstrate more faith in themselves than God. This paradigm places more importance on what the servant leader does than what God has done for the world in Jesus Christ. It isolates the pastor from the congregation and takes ministry out of the hands of the people. But friendship exalts the power within each person to be free to love. Friends do not obey each other, friends love each other into being. And because love is the end in itself, friends are relational and not task-oriented with each other. Such leaders see people as whole human beings who are made in the image of God. Indeed, no vision for the church or the means to accomplish it’s mission supersedes life together in faith, in worship, and in service. I also think it is interesting to note that when the Apostle Paul wanted to assist church leaders in selecting qualified leaders, he did so by providing a profile of character-skill sets (1 Timothy 3/Titus 1). While these qualities are core to any New Testament ministry, they don’t represent a complete list for all times. (Acts 6) The following profile offers insights and suggestions for the training of ministry leaders. How Do You Compare? · Displays self-awareness, self-directedness and self-improvement toward growth goals on personal, spiritual and professional levels. · Takes godliness seriously in character, integrity and credibility. · Conducts self to honor God in service to family, ministry, community and world. · Fosters growth in self and other. · Draws on resources of biblical, historical, and theological study for cultivation of commonsense insights relevant to contemporary life-circumstances. · Lets wisdom rise from observation, conversation and life.
. Acts out of biblical and theological foundations to express call and giftedness with the affirmation and authority of a known community.
. Knows value of gift-role-influence style-passion mix at personal, family, church, community, societal, global levels.
. Faces contingencies with reflective decisiveness.
. Suspends judgment until facts are in from those closest to threat or opportunity.
. Gets outside insight from family, mentors, team.
. Replicates healthy growth patterns in lives of others by capitalizing upon opportunities to be an improving influence.
. Makes mentoring a lifestyle value, a means and end of worthy ministry.